Solahart, an Australian company, has sold many passive solar water heaters over the years in the United States. Many people have had their systems since the 1980s or bought a house that came with a Solahart. Solaharts have served many people admirably, but every product has a useful life, and many of these Solahart water heaters’ time is up. We have received many inquiries recently from customers who were happy with their Solahart systems but now that they are not functional are replacing Solahart water heaters with a Sunbank. We’re happy to walk customers through this process and to let you know why the Sunbank, also a passive thermosypon system that is even easier to install, is the right choice for your next solar water heater. Your home is already plumbed for a passive solar water heater. For many installations, getting the water pipes from the roof to the conventional water heater or into the home is the biggest challenge. With that done, installing a new solar water heater is much easier. 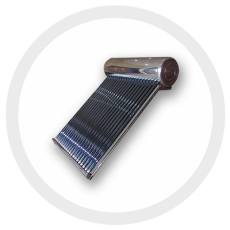 The Sunbank heats with evacuated solar collectors whereas the Solahart uses flat plate collectors. We go into more detail about evacuated tube collectors elsewhere on the site. We like both technologies but for different reasons. Flat plates are less expensive and not as well insulated, so they perform better when it is hot outside but no so great in the winter. This is great for large commercial installations that need to keep cost down and don’t mind uneven production. Evacuated tubes are almost perfectly insulated, so they outperform flat plates in the winter. Residential solar water heaters produce plenty of (sometimes too much) heat during the long days of the summer, but not during the short days of the winter. Since you can’t spin back the meter with the extra heat you produce, it’s much better to have more even annual production. Evacuated tubes don’t produce too much in the summer but give you more production when you need it most which means more savings. At Sunbank we pride ourselves and continue to work toward an easier installation. This opens up the market to DIY installers and cuts down on professional installation cost. Our new bracket is an exceptional example of this and the heat pipe collectors are much easier to install than charging a glycol loop. If you wonder why, look up how to charge a glycol loop. The Sunbank heat pipes go into a manifold essentially immersing them in the water. This will of course be more efficient than a system that uses an external jacket around a tank. Surrounded by water there is only one place for the heat to go. Whereas a jacket with one side contacting the tank means a certain percentage of the heat is lost to the atmosphere. Finally, there is cost. And as far as we know, we are more affordable than a similarly sized Solahart system. And if the Solahart is pre-heating a natural gas water heater in California, then the replacement will be eligible for the CSI rebate which pays up to $4,366 to install a Sunbank SB-80G. (Update 2/15/19 – up to $8,500 in certain communities. Also includes propane and wood burning water heaters. Contact us for more information). All systems are eligible for the 30% federal tax credit. 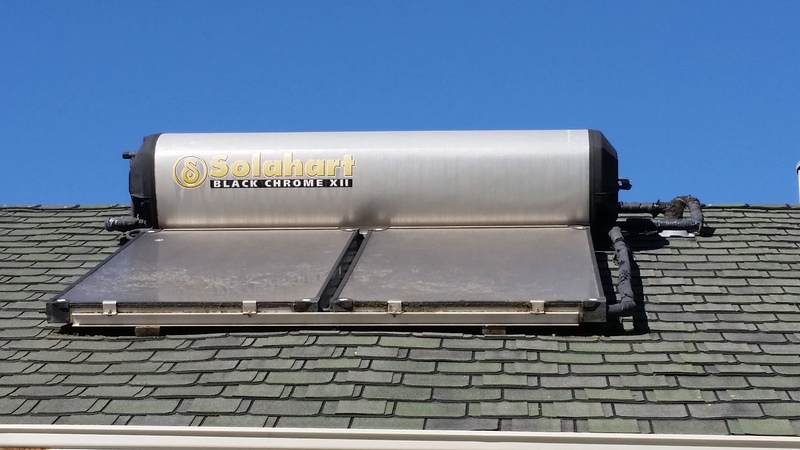 If you own a Solahart solar water heater and it is getting toward the end of its life, give us a call and we can talk you through the process of replacing your Solahart with a Sunbank solar water heater.